Carter Brey was appointed Principal Cello, The Fan Fox and Leslie R. Samuels Chair, of the New York Philharmonic in 1996. He made his official subscription debut with the Orchestra in May 1997 performing Tchaikovsky’s Rococo Variations under the direction of then Music Director Kurt Masur. He has since appeared as soloist almost every season, and was featured during The Bach Variations: A Philharmonic Festival, when he gave two performances of the cycle of all six of Bach’s cello suites. Most recently, he was the soloist in performances of Schumann’s Cello Concerto on the Orchestra’s CALIFORNIA 2016 tour, led by then Music Director Alan Gilbert. He rose to international attention in 1981 as a prizewinner in the Rostropovich International Cello Competition. The winner of the Gregor Piatigorsky Memorial Prize, Avery Fisher Career Grant, Young Concert Artists’ Michaels Award, and other honors, he also was the first musician to win the Arts Council of America’s Performing Arts Prize. Mr. Brey has appeared as soloist with virtually all the major orchestras in the United States, and performed under the batons of prominent conductors including Claudio Abbado, Semyon Bychkov, Sergiu Comissiona, and Christoph von Dohnányi. He is a member of the New York Philharmonic String Quartet, established in the 2016–17 season, and has made regular appearances with the Tokyo and Emerson string quartets,The Chamber Music Society of Lincoln Center, and at festivals such as Spoleto (both in the United States and Italy) and the Santa Fe and La Jolla Chamber Music festivals. He and pianist Christopher O’Riley recorded Le Grand Tango: Music of Latin America, a disc of compositions from South America and Mexico released on Helicon Records. Mr. Brey was educated at the Peabody Institute, where he studied with Laurence Lesser and Stephen Kates, and at Yale University, where he studied with Aldo Parisot and was a Wardwell Fellow and a Houpt Scholar. His violoncello is a rare J.B. Guadagnini made in Milan in 1754. THE FACTS: Born in Glen Ridge, New Jersey. Attended the Peabody Institute, studying with Laurence Lesser and Stephen Kates, and Yale University as a Wardwell Fellow and Houpt Scholar, studying with Aldo Parisot. Prior to the Philharmonic: soloist, and prize winner in major competitions. Most recent recording: the complete cello and piano works of Chopin, with Garrick Ohlsson. At the Philharmonic: Joined in 1996; solo debut in 1997 in Tchaikovsky’s Rococo Variations with Kurt Masur. WHEN DID YOU START LEARNING AN INSTRUMENT? I began the violin at 9, switched to the cello at 12, and began private lessons at 16. I thought the violin sounded shrill. I regret that decision every time I hear a Mozart violin concerto! 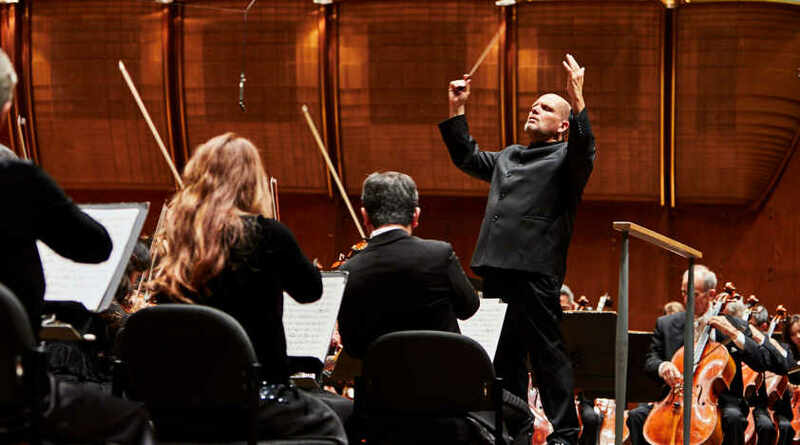 YOU HAD A MAJOR SOLO CAREER — WHY DID YOU JOIN THE PHILHARMONIC? It was a once-in-a-lifetime opportunity to join one of the great orchestras of the world, and it gave me more time to spend with my family. And I still occasionally go back on the road as a recitalist, soloist, or chamber musician. WHAT ARE YOU ESPECIALLY LOOKING FORWARD TO THIS SEASON? John Adams’s Absolute Jest. I’m part of the New York Philharmonic String Quartet, and we’re making our official debut as the solo ensemble in this piece. WHAT ARE YOU LISTENING TO RIGHT NOW? k.d. lang’s album of Canadian ballads, Hymns of the 49th Parallel. I always learn something about lyric phrasing from gifted pop artists like her. HOW DO YOU SPEND YOUR SUMMERS? I sail alone along the Atlantic coast in my 38-foot sloop. It clears my head and connects me to the primal power and beauty of the natural world.